Crispy Chicken Breast with Cauliflower Risotto Recipe. Thinking ahead to the weekend, I searched through the recipes of one of my favourite chefs, Donna Hay, and found just what I wanted to cook – a Crispy Chicken Breast with Cauliflower Risotto recipe. 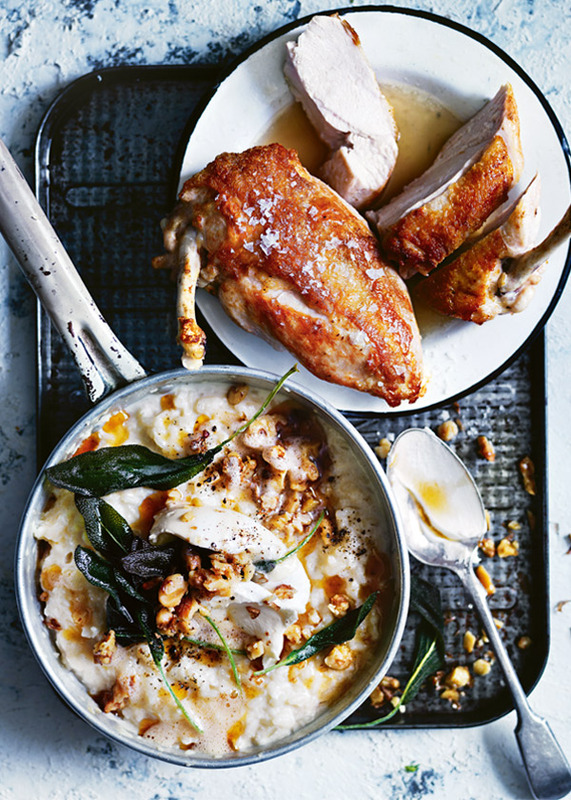 This recipe sounds perfect – the crispy skin outside of the succulent chicken breast, partnered with the soft, comforting flavour of finely chopped cauliflower risotto, given extra flavour, almost middle-eastern, with the addition of gently sweated onion and garlic and topped off with crunchy walnuts and crispy sage. Who wouldn’t want to eat such a fantastic feast. Probably the most important aspect of this dish is to try and buy the best chicken breast you can find. Definitely free range, organic if possible – the extra flavour will be worth the extra pennies spent. I would rather have Cheese and Biscuits for the next meal, than buy the ‘basic’ chicken portions from the Supermarket. So have a look at this picture, and tell me it doesn’t make your mouth water. Crispy Chicken Breast with Cauliflower Risotto – courtesy of Donna Hay. For this Crispy Chicken Breast with Cauliflower Risotto recipe, don't forget to find the best chicken breast fillets you can find. It will be worth it. I really love all the recipes from Donna Hay, and hope to cook loads more of hers in the future. They seem so full of flavour, so appealing on the eye yet not too rich or heavy. So hopefully you will enjoy creating and cooking this one - I'm really looking forward to it. Place cauliflower in the bowl of a food processor and, with short pulses, process until the mixture is finely chopped. Melt half the butter in a large deep-sided frying pan over medium heat. Add the onion and garlic and cook, stirring occasionally, for 4 - 5 mins or until softened. Add the wine and cook for 2 mins. Add the rice and cook, stirring, for 1 - 2 mins. Cook, stirring frequently for 18 mins while adding the stock, 1 cup (250ml) at a time, allowing it to absorb between each addition. Add the cauliflower and cook for a further 5 - 7 mins. Whilst the risotto is cooking, heat the oil in a large non-stick frying pan over a high heat. Add the chicken, skin-side down, sprinkle with plenty of salt and pepper and cook for 3 - 4 mins or until the skin is golden and crisp. Turn over, cover with a tight-fitting lid and cook for a further 4 - 5 mins or until thoroughly cooked through. Remove the chicken from the pan, cover loosely with aluminium foil and set aside. Wipe out the pan and return to medium heat. Add the walnuts, sage and remaining butter and cook gently for 2 - 3 mins or until browned, and the sage is crisp. (The sage needs gentle handling when crisp). Divide the risotto between plates and top with the mascarpone and walnut sage butter. Serve with the chicken. Well, that’s part of our weekend food sorted out. I must confess, I’m really looking forward to both making and eating this Crispy Chicken Breast with Cauliflower Risotto recipe. One: I just love making risotto, watching the stock being absorbed slowly into the rice, minute by minute (OK, maybe that’s just sad, but I don’t care) and Two: the dish just looks fantastic to eat. A big ‘Thank-you” to Donna Hay, and her fabulous recipe creations.